Cancer is a growth disorder of cells. 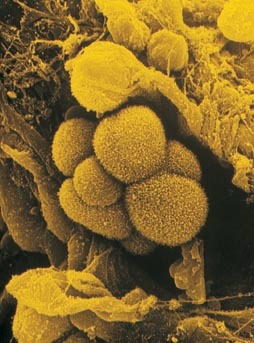 It starts when an apparently normal cell begins to grow in an uncontrolled and invasive way (figure 1). The result is a cluster of cells, called a tumor, that constantly expands in size. 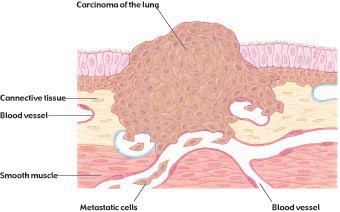 Cells that leave the tumor and spread throughout the body, forming new tumors at distant sites, are called metastases (figure 2). Cancer is perhaps the most pernicious disease. Of the children born in 1999, one-third will contract cancer at some time during their lives; one-fourth of the male children and one-third of the female children will someday die of cancer. Most of us have had family or friends affected by the disease. In 2002, an estimated 550,000 Americans died of cancer. Lung cancer cells (530x). These cells are from a tumor located in the alveolus (air sac) of a lung. Portrait of a cancer. This ball of cells is a carcinoma (cancer tumor) developing from epithelial cells that line the interior surface of a human lung. As the mass of cells grows, it invades surrounding tissues, eventually penetrating lymphatic and blood vessels, both plentiful within the lung. These vessels carry metastatic cancer cells throughout the body, where they lodge and grow, forming new masses of cancerous tissue. Not surprisingly, researchers are expending a great deal of effort to learn the cause of this disease. Scientists have made a great deal of progress in the last 20 years using molecular biological techniques, and the rough outlines of understanding are now emerging. We now know that cancer is a gene disorder of somatic tissue, in which damaged genes fail to properly control cell proliferation. The cell division cycle is regulated by a sophisticated group of proteins. Cancer results from the mutation of the genes encoding these proteins. Cancer can be caused by chemicals that mutate DNA or in some instances by viruses that circumvent the cells normal proliferation controls. Whatever the immediate cause, however, all cancers are characterized by unrestrained growth and division. Cell division never stops in a cancerous line of cells. Cancer cells are virtually immortaluntil the body in which they reside dies. Cancer is unrestrained cell proliferation caused by damage to genes regulating the cell division cycle.